It was a sad Tuesday night at Kuwait City for Philippine Azkals after suffered another loss to Kuwait Al-Azraq Football National Team. 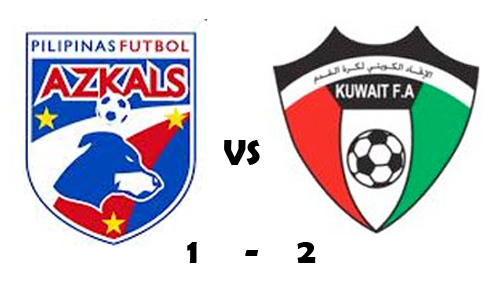 Azkals lost to Kuwait, 1-2, in their international friendly game at the Kuwait Sports Club Stadium in Kaifan. Kuwait team is on FIFA rank 112 globally while Philippine Azkals is on rank 147. This is the second loss of Azkals but the first one is not counted over Laos team because of some issues. According to report, Philippine Azkals had 10 scoring attempts against Kuwait's 13. And 3 Azkals players were given yellow cards for fouls, while Kuwait had 2 players who were booked. Meanwhile, This friendly game of Azkals is preparations for their upcoming AFF Suzuki Cup campaign. Comments or suggestions about "Philippine Azkals fall to Kuwait October 16, 2012" is important to us, you may share it by using the comment box below.